VidyoDesktop™ turns Windows™, Mac™ and Linux™ based laptops and desktops into personal telepresence endpoints. Transforms Windows, Mac and Linux PCs into high-performance endpoints. Switch between active speaker, continuous presence and content sharing layouts. VidyoDesktop™ software puts high-quality video conferencing at your fingertips. 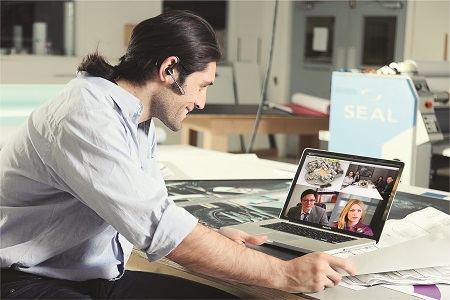 Now it’s easier than ever to join or host person-to-person and multi-party video conferences from a business or home office, or while on the road. VidyoDesktop easily connects with mobile devices, room systems, legacy equipment, and integrates with unified communications apps. And Vidyo provides all this desktop functionality at a fraction of the cost of other solutions. Extreme Definition (XD) up to 1440p resolution . Display up to 8 participants in continuous presence, ideal for team discussions. Dial directly for point-to-point calls or host dozens of participants from mobile, desktop or room-based endpoints. Adaptive Video Layering™ dynamically optimizes video streams to capabilities of each endpoint device and network conditions. Vidyo provides the first and only software platform for high-quality video communication on everyday devices and IP networks, with massive scalability at just 10% of the cost of alternatives. More than 2,000 companies use Vidyo products to improve interactions and workflow.